We left for Vancouver Sunday afternoon. 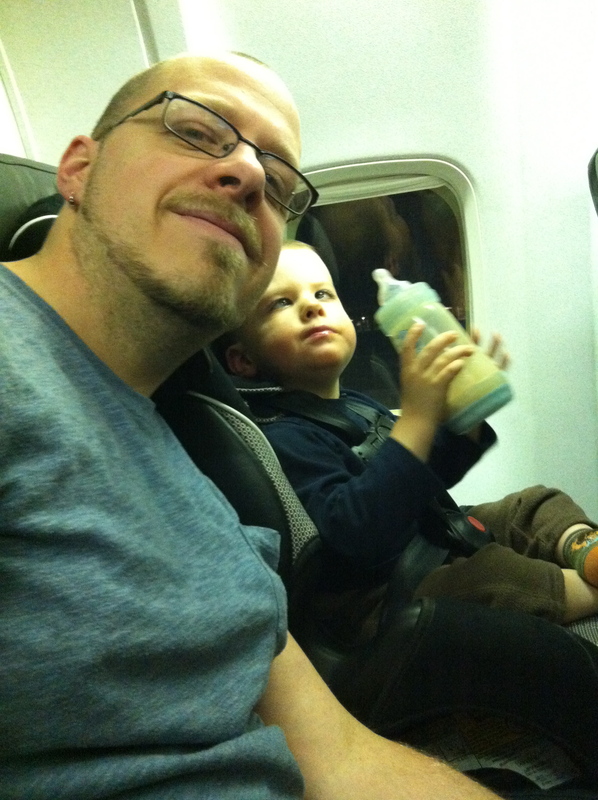 Ozzie is a super awesome flier, provided there is plenty of Chocolate milk, a fully charged iPod, and books to read. The weather was pretty gross when we left, so our flight was delayed, and our connecting flight in Calgary was delayed, which meant when we actually landed in Vancouver it was 6:30…which was 8:30 our time. 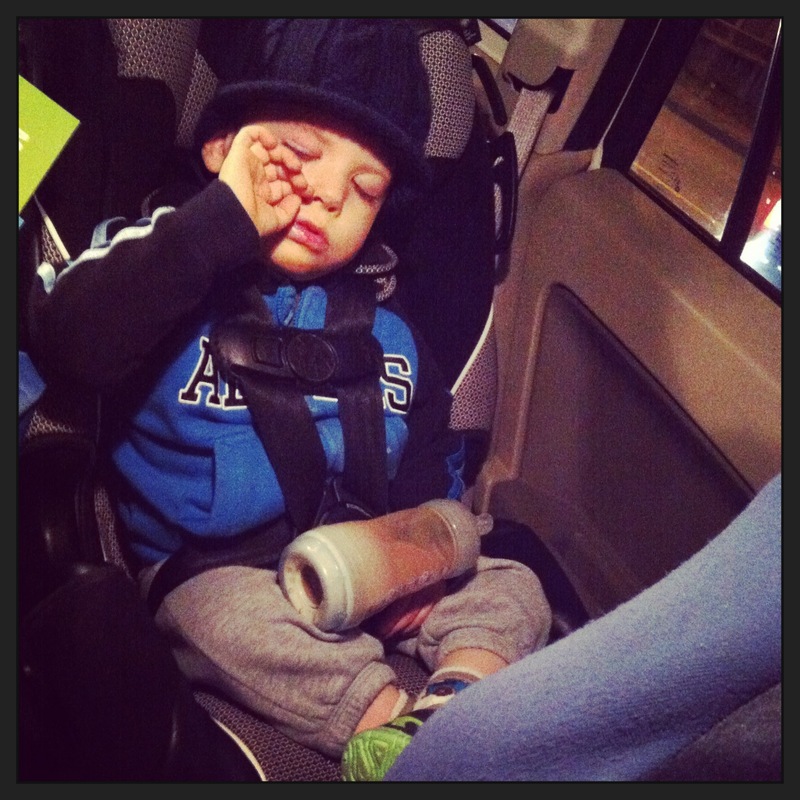 Our little man was tired, but he hardly complained, lucky for us. My Uncle Jim picked us up from the airport and drove us out to Maple Ridge (about an hour out of Vancouver) where we were staying with my Uncle Rob and his family. Ozzie loves taking pictures of his feet. Brady is 3, his birthday is at the end of October, just weeks after Ozzie’s birthday. He was so excited to play with Ozzie, and brought him cars and transformers to play with, but Ozzie was a little overwhelmed by all the attention and retreated to the safety of mama or dada, whichever was closest. But that’s okay, because Brady was just as happy to be with Brad or I, he’s a total cuddle-bug. 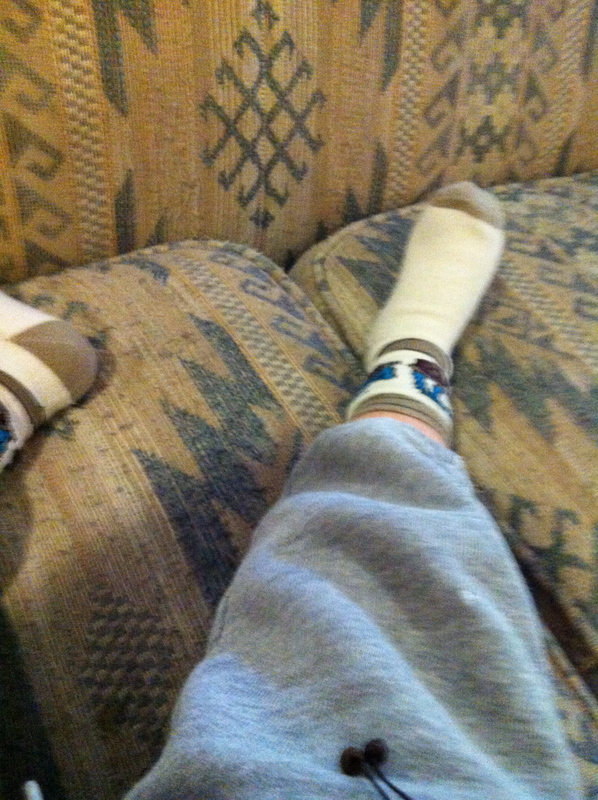 Brady sat down beside me on the couch and said: “Hi, it’s me! Brady!” before climbing into my lap too. 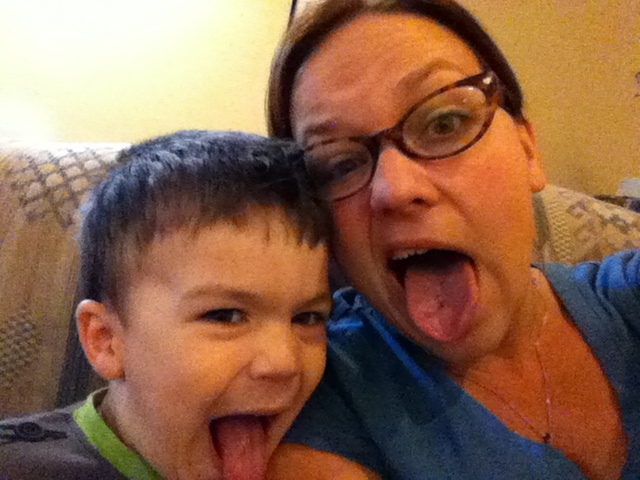 I thought this photo was funny…. 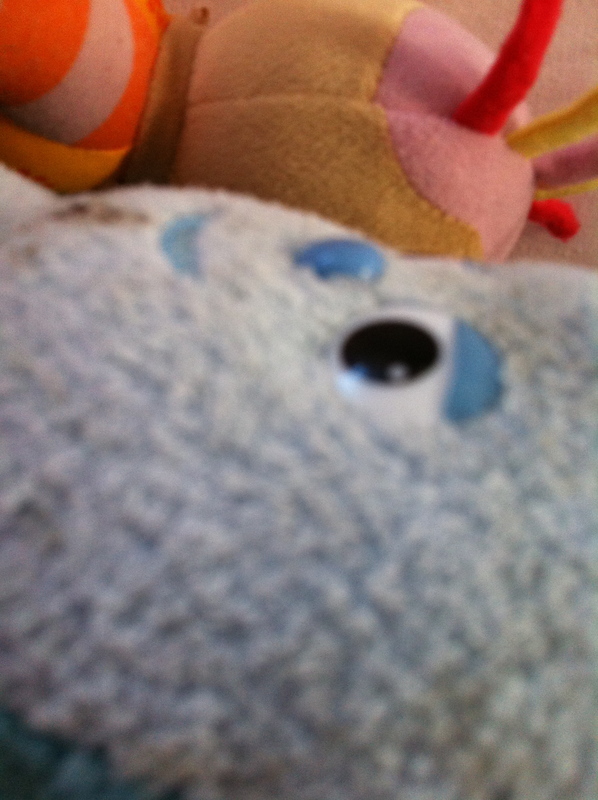 Ozzie took it… BLACKMAIL PHOTOS showing Upsy Daisy and Iggle Piggle engaging in questionable activities!! what will Makka Pakka think?? 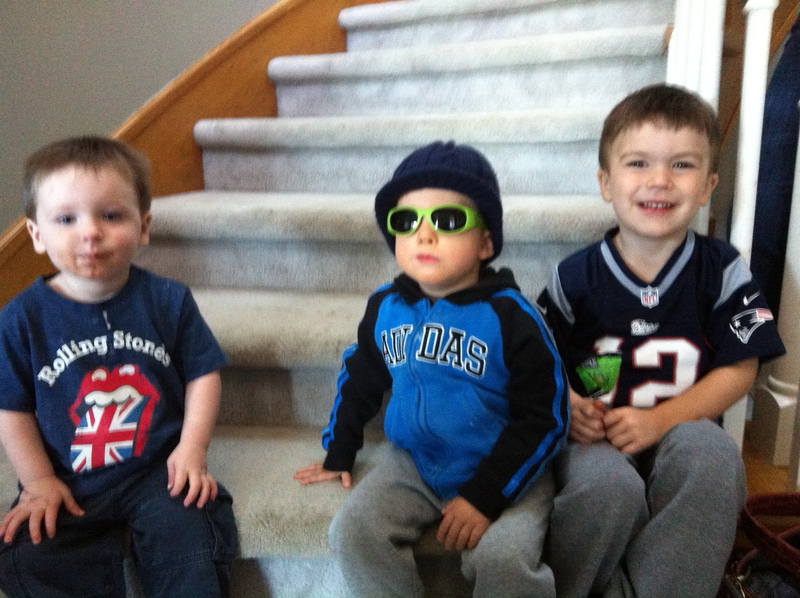 Here’s a photo of Carter, who will be 2 in march, and Ozzie and Brady. It was pretty crazy to see these three boys together, Ozzie is the oldest, and yet he’s the same height as Carter who is a year younger than him… my little shorty man. Our appointment was on Monday afternoon, and my Grandma lent us her car so we could drive to the Children’s Hospital and back. 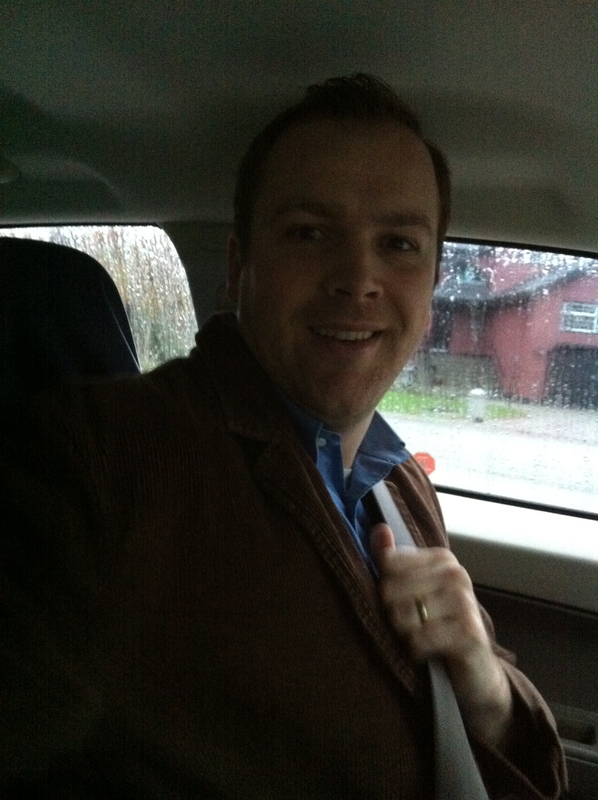 It was a little nerve wracking at first, to drive into Vancouver. We had both of our phones going, mine with the step by step instructions, and brad’s with the GPS Apple Maps so we could see our current location. It was simple enough, once we got past all the construction and the exits and ramps and things. we were a bit early, we wanted to make sure we had a lot of time to get to where we were going… so we had some lunch in the Hospital cafeteria… which had a burger place, and a sushi counter, and pizza, as well as Extreme Pita… along with the the regular cafeteria foods like sandwiches, salads, and soups, etc. OOOOooooh Children’s Hospital of Saskatchewan… i hope you are taking notes and have some healthier options in your cafeteria…. 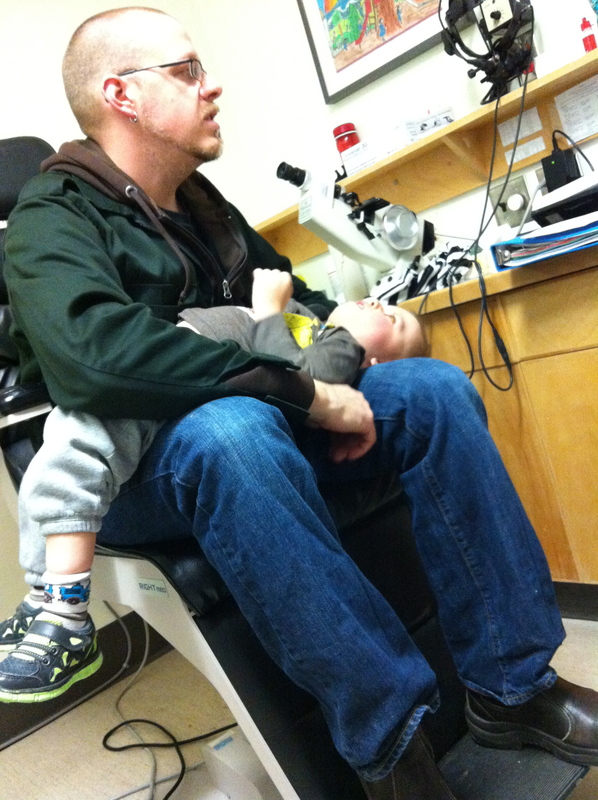 first up was the eye exam, which Ozzie did okay with. We could pretty much bribe him with anything as long as he knew he would get the iPod afterwards. They tried to get Ozzie to follow their lights, and they patched him which he DID NOT LIKE. This test was not any different than the ones he’s had in Saskatoon. Pretty standard test, i suppose. 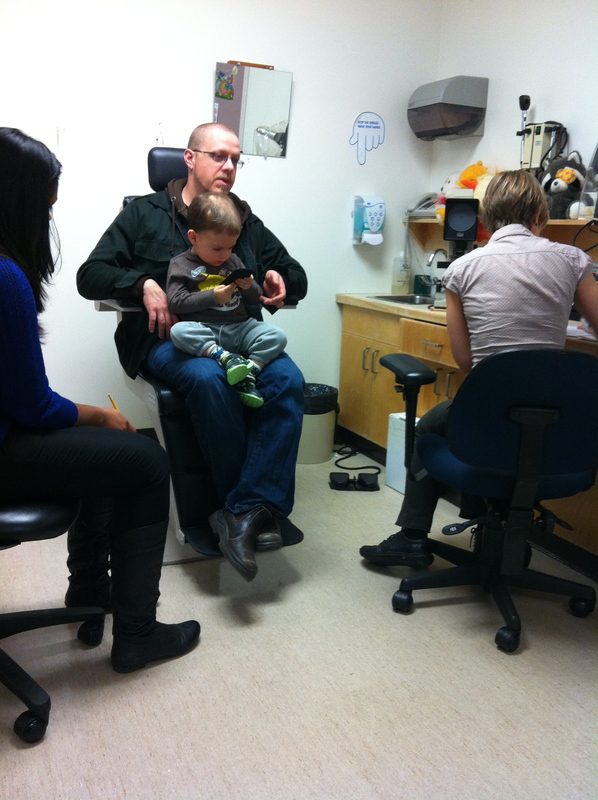 in the next test he had his pupils dilated with dilating drops. She told us that there’s a bit of scratching on his corneas, so we need to be lubricating his eyes on a more regular basis. I asked if his corneas were damaged, and she said no. She likened it to having chapped lips, and if we keep them moist more regularly it will be more comfortable for Ozzie and the corneas will heal. She also tested his vision, which is excellent. They confirmed what our ophthalmologist told us in Saskatoon, that Ozzie uses each eye independently, and that his eyes are crossed because the inside muscles of his eye have had no resistance because there’s no information getting to the muscles on the outside of his eye, which is consistent with Cranial Nerve 6 malformation or deletion which occurs in people with Moebius Syndrome. his pupils were so big, it’s too bad i couldn’t get a better picture. Finally we met with Dr. Lyons. He was very nice and gave us a lot of information about what he thinks we should do. Basically, we’ve missed the window where surgery would have helped his brain to use both eyes together. He said to have that happen the surgery should have been done around 6 months, with the window closing around 2.5 years. We were pretty occupied with other things at those times, like keeping him alive. He said he’s happy to do the surgery, and that there is no rush so whenever we’d like to go forward is when it will happen. He recommended before he goes to school, to help with socialization, which we sort of agree with also. Then he walked us through the surgery and what that would entail. So, there are 4 muscles groups that move the eye. The muscles on the inside of his eyes (the Medial Rectus) have been pulling his eyes in, and they may be very tight, almost like leather, he said, because they haven’t had any resistance from the outer muscles (the Lateral Rectus). He would like to inject those inner muscles with Botulinum Toxin, otherwise known as Botox, to paralyze the muscles first. 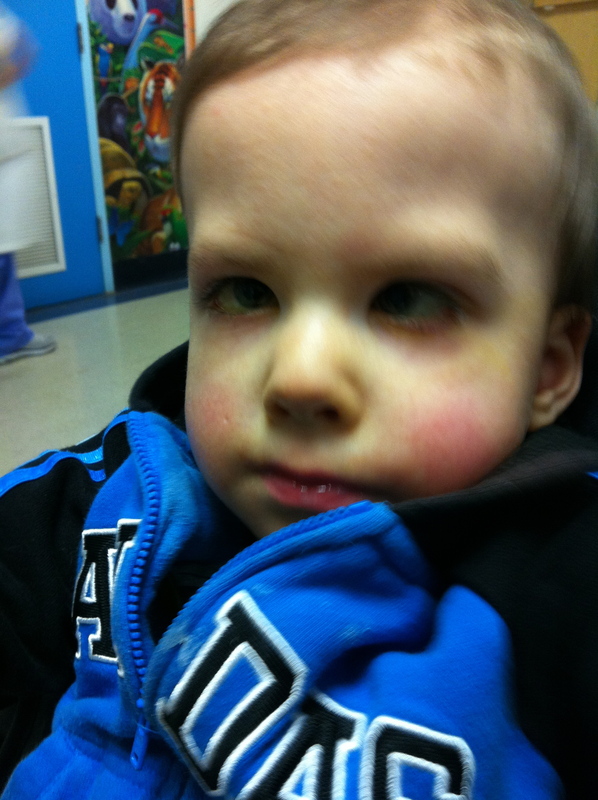 With those muscles paralyzed we can see if his eyes will correct out a little bit without having to actually cut him. This is the BEST case scenario. From there, he would move the upper and lower muscles (Superior and Inferior Rectus) out and away from the inner eye muscles. This is the most likely scenario. Having them farther out will give the eyes the resistance they need to stay straight, however it’s not an exact science, and it may take 3-4 surgeries to get the placement right. If the inner eye muscles are SUPER tight, he may also have to move them, to make them shorter, essentially. The problem is that each time he needs to move a muscle, he has to disrupt the blood vessels that supply the eyes with blood to keep his eyes healthy. He said that ideally, he would inject Ozzie’s eyes with the Botox a week or two before the surgery to see how they react, rather than doing it at the same time as the surgery, but he didn’t want us to have to fly out there for a procedure, then fly home, only to come back a week later for the surgery. 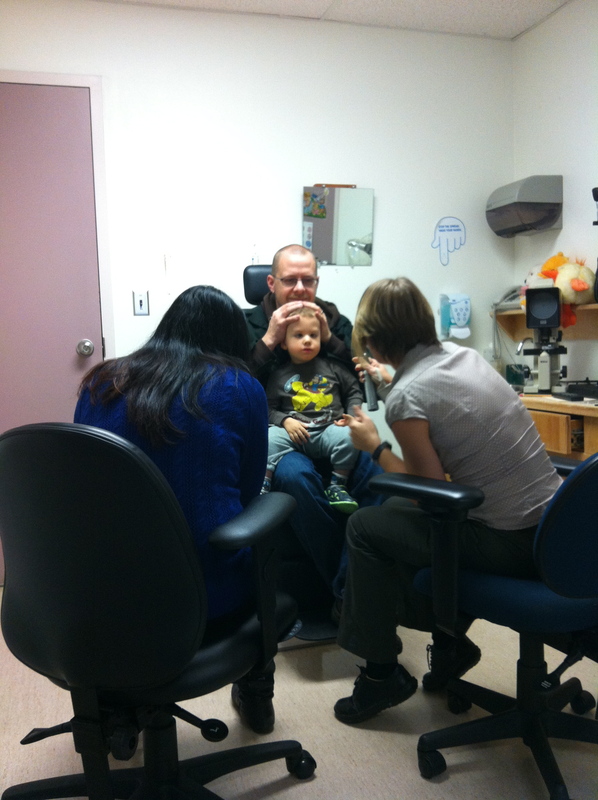 So, we asked if that was something that our ophthalmologist could do here in Saskatoon? He said that, yes, she could if she was comfortable putting Ozzie under General Anesthetics (which she’s not – part of the reason we were referred to Dr. Lyons in the first place) but he is going to write her a letter explaining the plan and that he’d like for her to do the injections here. So hopefully that will work out. Then Brad got to ask about patching. We’ve asked about patching, here in saskatoon, but were just told flat out: “Yeah, that won’t do anything”. So brad asked the doc about patching Ozzie just to see what he’s capable of. 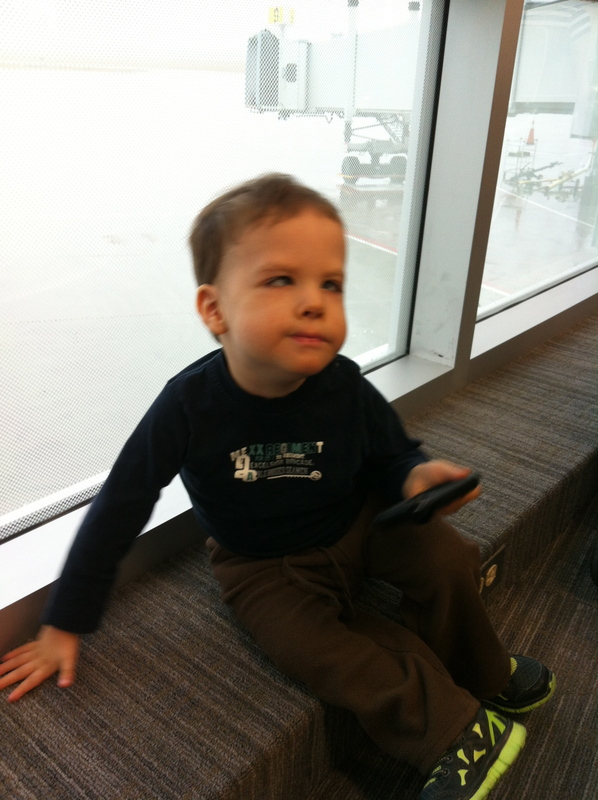 We were also told he wouldn’t be able to blink (which he does, if he thinks about it, something Brad taught him to do) and we were also told he’d never smile (which he does) so who’s to say that Patching might actually help? We don’t actually KNOW what Ozzie’s capable of until we try. This doctor said: “It certainly can’t hurt him to try” which made Brad feel great, because if we don’t try before surgery, brad would never be able to stop wondering what might have happened if we had tried. We were the last appointment of the day, and Dr. Lyons said he appreciated that we came a very long way to see him so he really took the time to answer all our questions and to make us feel listened to and comfortable with him as a surgeon. We really appreciated that. We left his office at 5:15, and made our way back home to my Uncle’s house. Poor dude was exhausted, and could you blame him? 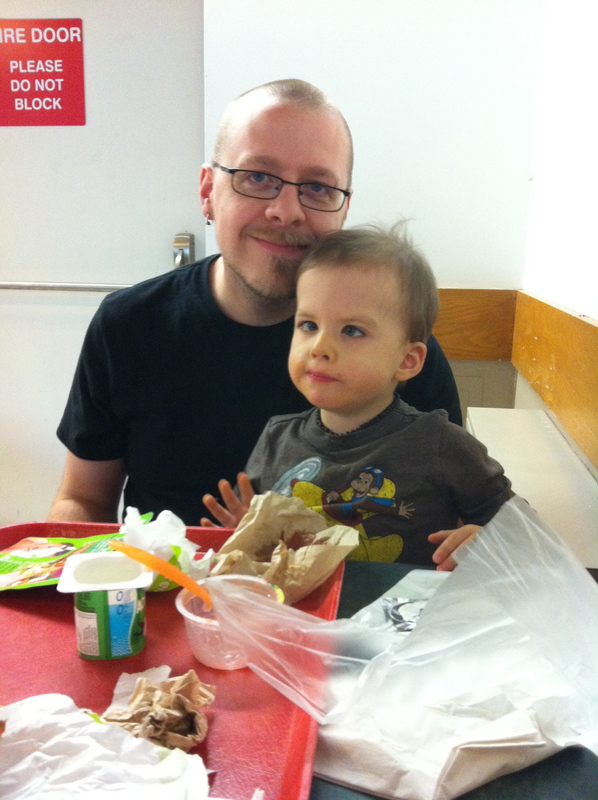 It was practically his bedtime (in Saskatoon) by the time we left the hospital. 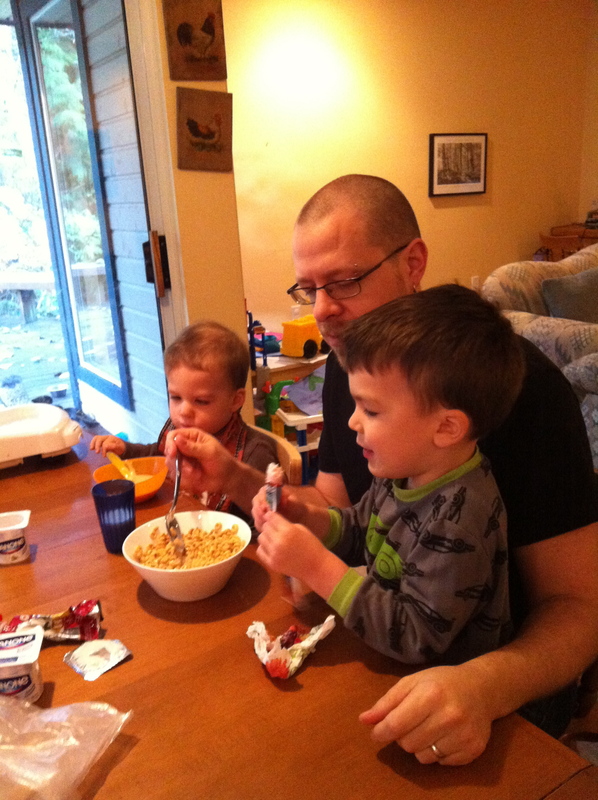 Luckily, he went to bed really easily, because in the morning after breakfast we were going home on the airplane! 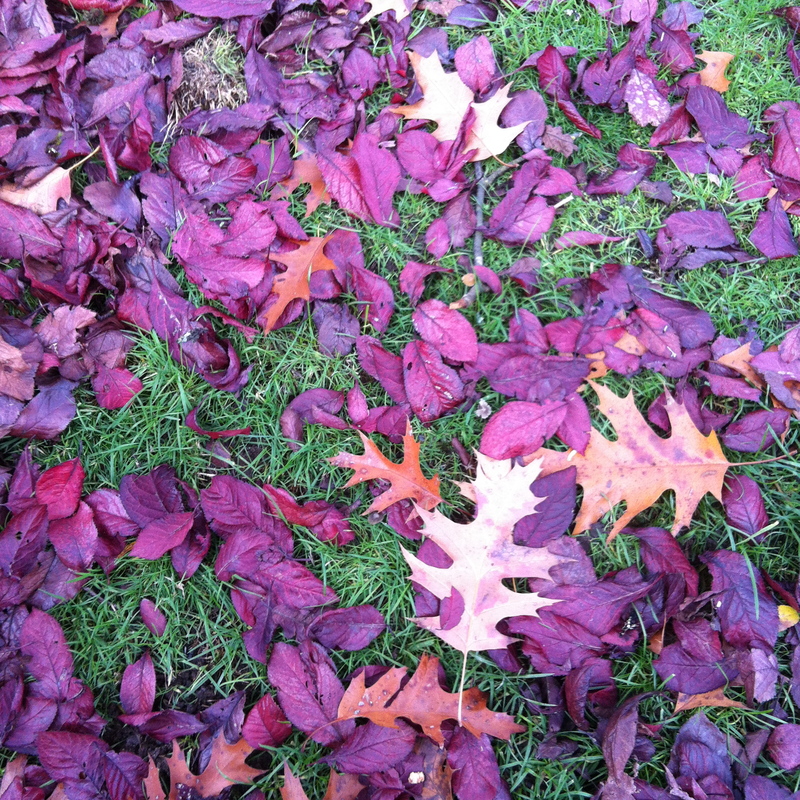 The next day was rainy and yucky, a total contrast to the beautiful day we had the day before. My Uncle Rob drove us to the airport on his way to work. Ozzie was so happy to be going home, and we were too. Brad and I were also happy to get free drinks (we were sitting in WestJet’s Plus Section – We upgraded brad’s seat so he’d be in the plus section with Ozzie and i) and a snack! 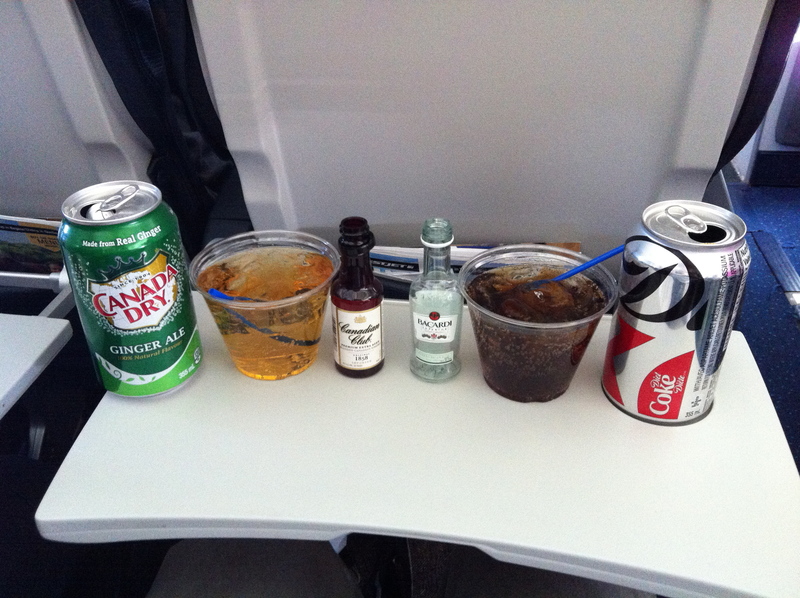 Yay Airplane booze! and because our flight touched down in Calgary, but we didn’t actually have to deboard, we got a second round from Calgary to Saskatoon. 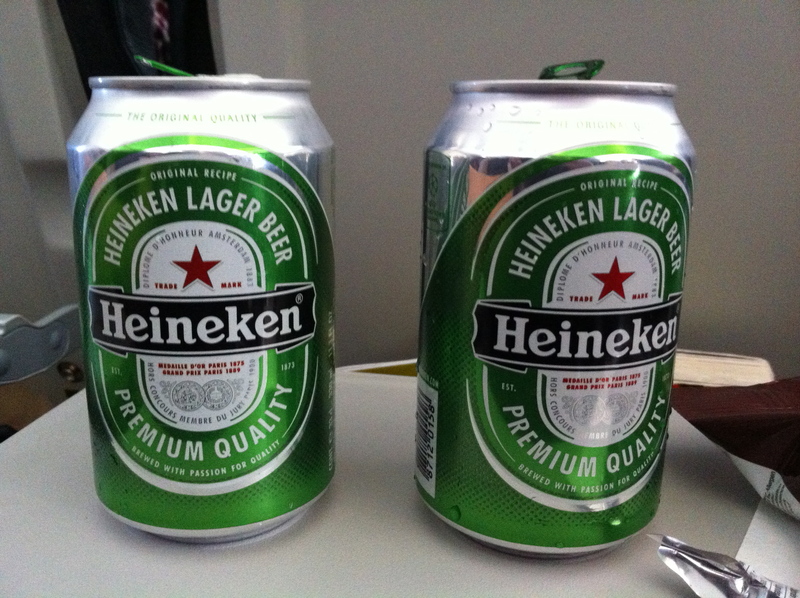 Yay Airplane beer! 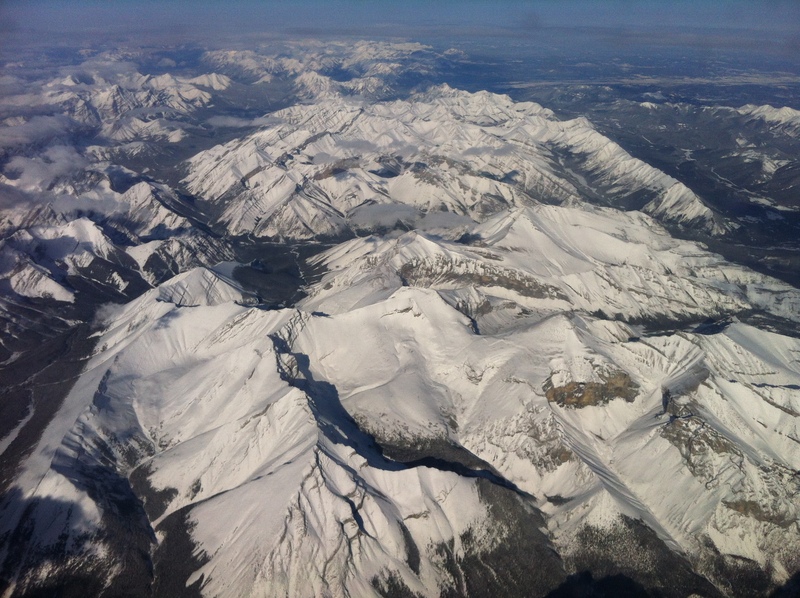 Ozzie didn’t really have any interest in looking out the window, but we did get to see a bit of the rockies as we flew over them before Ozzie shut the window… it was pretty bright for his poor little eyes. I also wanted to say a really heart felt thank you to my mom and dad for dropping us off at the the airport and watching Cedric Sunday afternoon, taking him to TaeKwon Do, and keeping him overnight and then taking him to school in the morning. And to Brad’s mom and dad for picking Cedric up from school and keeping him overnight Monday night, and then picking us up from the Airport Tuesday Afternoon. We are really blessed with great families. Thank you so much. It’s nice to just Not Worry about Cedric because we know he’s with people who love him and that he’s safe. ❤ we love you guys!! So, now we will look into patching Ozzie and seeing how that goes, and wait to hear from Dr Lyons and/or Dr. Erraguntla regarding the Botox injections, and then we go from there.